What it’s about: Iris Chase’s life has been marked by tragedy, most importantly on the day her sister Laura drove her car over a bridge, ending her own life. Since then, decades have passed and one by one all of Iris’s relatives have passed away. First her husband Richard died under mysterious circumstances aboard their yacht. Then her daughter Aimee was found dead in her apartment, killed by alcohol or a fall down the stairs. Her controlling sister-in-law Winifred has finally passed on, the only member of the family to succumb to old age. Iris’s only remaining links to humanity are her estranged granddaughter Sabrina and her caretaker Myra, the daughter of Iris’s childhood housekeeper Reenie. Now an elderly woman, Iris embarks on an important project, namely, to set the record straight about their family. She’s not even sure for whom she’s writing, perhaps for Sabrina, perhaps for Myra, perhaps for posterity or just for herself. 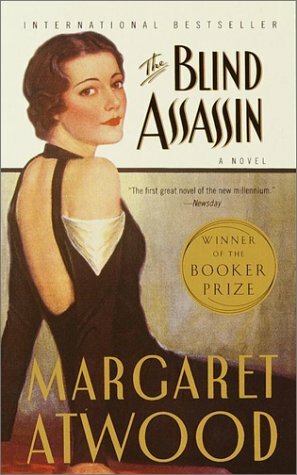 But her history has been buried until now and it’s all wrapped up in Laura’s posthumously published novel, The Blind Assassin. Many believe the novel, which tells of an elicit affair between two unnamed lovers, must be autobiographical, but Iris has never confirmed or denied the details of her sister’s life. Now, approaching death herself, Iris pens a memoir of her and Laura’s life, beginning with their childhood as the privileged Chase daughters, heirs to the local button empire. She tells of Laura’s strangeness, her air of being removed from reality and her tendency to interpret everything literally. Iris feels obligated to protect her sister, even up to the point of agreeing to an arranged marriage. Iris’s reminisces will reveal that all is not as it seems with Laura’s acclaimed novel. Sisterly love: The Blind Assassin, while being a story about love, repression, longing, and society, is at heart the story of sisters. I’ve always wondered what it would be like to have a sister, and my overwhelming opinion is that I got lucky in only having a brother. Looking at the real-life sisters I know, there’s almost always some kind of struggle and heartbreak between the two. It’s a troubled relationship, because most of these women are extremely close but also constantly find themselves clashing. I could name only one or two sisterly pairs I know who truly have a relationship that isn’t competitive or jealous, who act less like sisters and more like friends. Laura and Iris are just another accounting of the complexity of sisterhood. Would I recommend? Yes. As I’ve mentioned previously, Margaret Atwood is one of my favorite authors. I’ve read books of hers in two distinct veins: women-centric and post-apocalyptic. Though I liked The Year of the Flood better (see my review here) than the The Blind Assassin, I did thoroughly enjoy her storytelling.